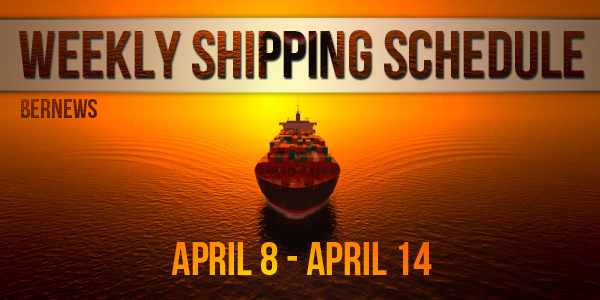 The Department of Marine & Ports Services has released the weekly shipping schedule for ship arrivals commencing on Saturday April 8th. On Saturday the Ile De Sein cable ship is expected, on Sunday the Caribbean Princess cruise ship and the Lacanau oil/chemical tanker will arrive, and on Monday the Walther Herwig III fishery research vessel and the Oleander container ship are scheduled to arrive. On Tuesday the Danmark training ship is expected, on Wednesday the Somers Isles container ship will arrive, and on Thursday the Evie PG oil products tanker and the Bermuda Islander container ship are scheduled to arrive.